Uefa has reduced Dynamo Kyiv’s ban to one match. DYNAMO KIEV’S CHAMPIONS League last-16 clash with Manchester City later this month will no longer be held behind closed doors after Uefa lifted its ban. The first leg of their tie on 24 February was due to be played with no fans present after the Ukrainian champions were were fined €100,000 and ordered to play two Uefa home matches behind closed doors — with a third suspended — after charges of racist behaviour, crowd disturbances and of having blocked stairways at the Olympic Stadium against Chelsea on 20 October. 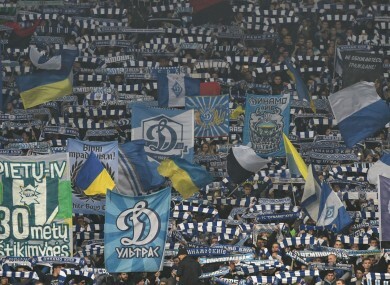 However, Uefa has reduced the sanctions after Dynamo launched an appeal. “1. To order the Dynamo Kyiv to play one Uefa competition match as host club behind closed doors. “As the club has already played one match behind closed doors during the Uefa Champions League 2015/2016 match FC Dynamo Kyiv vs Maccabi Tel-Aviv played on 9 December, 2015, the club has already served this sanction. Email “Man City will no longer be playing their Champions League last-16 clash behind closed doors”. Feedback on “Man City will no longer be playing their Champions League last-16 clash behind closed doors”.